It is currently Thu Apr 18, 2019 8:19 am. There are a lot of "guides" out there for new players starting out, however I have not seen a comprehensive one that covers several aspects of the game. I will try to accomplish just that. Veteran players are more than welcome to contribute to this guide by either PMing me information they think it should include or just posting below. This original post will be edited accordingly to reflect the most current information. As you probably have figured out by now, Ultima Online is a MMORPG which came out in 1997 culminating the series of Ultima games crated by Richard Garriott (Lord British). After many revision, expansions, and patches, the "original" game is still going and is currently run by Electronic Arts in a pay-to-play format. UO Second Age is an independent "Free-Shard" which was created four years ago, and aims to recreate UO at the time of the "The Second Age" expansion, and more specifically at or around the time of Publish 1 dated Nov. 23, 1999. UOSA is free to play, however, the upkeep costs are significant, for which players are encouraged to donate to the shard by using the donation methods described on this link. Although UOSA will run on any client newer than the 5.0.0.0 version, it is highly recommended you use the download-able client from the main site, which can be found here. Here in UOSA you can create up to 3 accounts, and multi-clienting is allowed. Each account can hold up to 5 characters, which means you can have up to 15 characters, with 3 being able to be logged on at the same time!! Alright, enough chit-chat, let's get down to the good stuff. So you have downloaded the client and are ready to create your first character. What to do? UOSA is a great game in the sense that you can do/be ANYTHING you want!!! In future sections we are going to touch up on things like templates (skill sets), how to make money for starters, and other important information that will be useful for when you want to create a character. Just know a couple of basics right now. Always go to the "advanced" feature of character creation, do not use the preset templates (Warrior, Ninja, Necromancer, etc.) as they will stick you with some preset skill set which might not be ideal for you. When you choose some skills as "starter" skills, even if you only have 1 point assigned to them, you will get some specific "starting equipment". This is important, as all starter equipment is noobied, which means it cannot be stolen or looted off your body if you die with them on you (unless you are a murderer or have the item inside another container in your backpack). For a list of starter equipment per skill, follow this link. Particularly for bards, a noobied instrument is very important, as it will never break, and will stay with you even after death. Same goes for a compass for a treasure hunter or a fishing pole for a fisherman, or scissors for basically any profession. Other than clothing, the rest of the items are not as vital as they will break or are easily replaceable. Remember you can make up to 15 characters, and "noobied" items will stay noobied even if you transfer them between characters, so don't stress too much over starting equipment, you can always make "throw-away" characters for the equipment, and delete them a week after they where created. Keep in mind however, that noobied items have an accelerated decay rate, and will disappear if left on the ground for more than a couple of minutes. Same will happen inside a house if they are not locked down (other items don't decay inside houses, but more on that later). Now when choosing skills you might not want to "waste" skill points in skills which are cheap or free to gain. You might as well assign those skill points to skills which will be really useful right out of the gate, and/or which require more time and resources to macro. Some of the hardest / most expensive skills to macro (and which you should include in your starting skill set in case you'll include them in your template) are, but not limited to: Alchemy, Animal Taming, Archery, Blacksmithy, Carpentry, Cartography, Healing, Inscription, Magery, Meditation*, Poisoning, Resist Spells* and Veterinary. (I include an * next to Meditation and Resist, as both are kind of a pain to GM, but are easy to macro beyond the point at which you start at, so do not choose them unless you don't have a better alternative.) All other skills are relatively simple, cheap and easy to macro beyond the point you could have started with. Magery - Is probably the most essential skill to make your life easier. Magery conjures up spells that can help you to travel great distances instantly, can cause a considerable amount of damage to your foes, and a slew of other functions. This however, is not a skill that is most efficient at a skill level of 50, you will need to train it up if you want to use it efficiently. Now don't get me wrong, it is still very useful at a skill level of 50, you just won't be hunting much with magery as your main means of inflicting damage, as it will be more expensive than what you could get from your prey. Training up magery is expensive, and we'll get to this section later. For some other basic concepts regarding magery, I suggest reading this link. Weapon skills (swordsmanship, mace fighting, fencing, archery) - These skills are the bread and butter of every warrior. Your skill level on each of these skills will determine the probability of hitting a foe with your weapon. The damage you inflict is calculated using other skills such as Tactics and Anatomy, both of which give a damage bonus to your "melee" skill. You can find out more about weapon skills here. I am very often asked, which is the best weapon / weapon skill to start out with. I always suggest swordsmanship, as these types of weapons are the cheapest and most readily available. A very good weapon you can find for cheap is the Broadsword. Cutlasses, Katanas and Scimitars are also viable weapons for swordsmen. For more regarding weapons, follow this link. Healing - Another of the popular skills is healing. This skill is used to heal damage your character or another human is receiving. To use the healing skill, simply double click a clean bandage, and target the person you wish to heal. Healing is maximized when the character also uses Anatomy, as it will increase the amount of damage which can be healed. For more information on healing, follow this link. You will also need to choose your starting "stats", which are your strength (which directly translates to hit points/health, which means the higher the better), intelligence (which translates to mana, and vital for any magery based character), and dexterity (which is stamina, and mostly useful for warrior, and characters with melee as their main source of attack). Strength is hands down the easiest stat to raise, so you should always start that out at 10. If your character is going to be a magery based character, I strongly suggest you start out with 60 intelligence, as it is probably the hardest stat to raise. If you're character will have limited intelligence (25, 30, or any other number) you can mix between dexterity and intelligence depending on where you want either to end up. Raising these stats will be touched upon in another section. Now you will see a screen that will allow you to choose the city where you want to start. Britain is the capital city, and where you will see most player traffic. It is also the city with the largest concentration of thieves and griefers on the shard. Choosing Britain is fine, as long as you know what you are getting into, and are prepared for it. UO is a cutthroat game, and only God knows how many new players have quit because they where robbed blind while standing around at the bank in Britain. Personally, I always recommend starting in cities with less traffic, solid vendors (both NPC [non-player character] and player ran) and "quieter" alleys for macroing. 3 cities that fufil this description are Vesper, Trinsic and Skara Brae (although player run vendors are much weaker in this last one). Congratulations, you are now inside the world that is Ultima Online!! You probably have figured out how to move about UO by now, but in case you haven't, to walk, just hold down your right-mouse button. To interact with other players or NPC's, you'll most likely need to talk to them. Just start typing and hit enter! For a list of commands/interactions with NPC's follow this link. Moving around the map can be quite confusing and challenging for new players. Mardas created a very good guide which can be found here. Probably the most important piece of information there is that mounts will eventually get fatigued. Horses, Forest Ostards and Desert Ostards, all have roughly the same stamina, and will allow you to run for about a minute before becoming fatigued. To refresh your mount's stamina, simply hop off, say "all follow me", and hop back on. The mechanic behind this is that as long as the mount is in "follow mode", it will be refreshed when you unmount. This means that once you have said "all follow me" while unmounted, you can only jump off and back on without having to say "all follow me". Other types of mounts have higher stamina, these being Frenzied Ostards and Nightmares. Making money is one of every new player's main concern when they are starting out from scratch. There are many ways to accomplish this. A very effective method is touched upon in this forum post. Of course, it is not the only one. A couple of other reduced risk methods are: mining, lumberjacking and gathering cloth/tailoring. There is generally a healthy demand for ingots, cloth (bandages) and boards. Clothes and other tailored items can be sold to NPC vendors for a hefty profit. It is very useful as a miner to complement his character with the tinkering skill. This skill will allow you to create shovels when the one you are using breaks, instead of having to stop mining and run back to town to buy one. Some miners move on to become blacksmiths. Keep this in mind if you feel this is the route you want to follow, because creating a character with 50 blacksmithy to start will save you a lot of ingots/money in the long run. Also a higher mining skill, not only increases your chances of successfully smelting ore, but also increases the yield when smelting items. This is also helpful for when you are training blacksmithy. The basis behind lumberjacking is the same as for mining, except that for chopping logs off trees, and creating those logs into boards. As opposed to mining, there is no skill check to create boards from logs, and like mining, the number of trees surrounding the one you are chopping will impact the amount of wood you can extract. Good cities to start at if you are a lumberjack are: Yew, Vesper, Britain, Minoc and Skara Brae. The principle behind lumberjacking is the same as mining, so some of the mining macros can be adapted to lumberjacking. At the date of this post, boards also have a decent demand and are normally sold to other players at a rate of 3 gp's per board. Now on to tailoring and cloth making. This is possibly the most lucrative of the options presented here if done right. There are several cities which have cotton fields and/or sheep pens. Some of the best cotton fields are in Cove, Delucia, Skara Brae and Moonglow (which also has a flax field). Sheep pens can be found in Yew, and there is also a healthy amount of sheep just NW of Delucia. The aim here is to gather as much cotton and wool as possible, and go to a tailor shop equipped with a spinning wheel and loom. If you double click the cotton, wool or flax and target the spinning wheel you will create spools of thread or balls of yarn. These can in turn be double clicked and when you target a loom, they will be turned into bolts of cloth. 5 spools/balls of yarn will yield one bolt of cloth. Now comes an interesting decision. If you want to make easy money, turn that cloth into bandages, and sell them to players. Most players will pay between 1.5-2 gps per bandage at the time of this post. To make bandages, simply dbl click your scissors and target the bolt of cloth, then repeat and target the "cut cloth". This is quite easy, if time consuming, by making a simple razor macro for it. If you want to maximize profit (albeit with a little more work) you can use that cloth to make clothing. Clothing can be sold to NPC tailors, and considering that the only thing invested was a little time to gather the resources, maybe some regs to move around, and a sewing kit to make the clothes, the profit margin on clothes can be very nice. Start making fancy shirts, those seem to get the best returns. However keep in mind that when selling to NPC vendors, the price they pay for an item will start reducing after multiple items sold. To get your best "bang for your buck" move between cities and visit as many tailor shops as possible to sell your wares so the NPC's pay you top-gold-piece per item sold. When your skill is high enough, you can graduate to making leather armor (and here's where the serious money starts rolling in). Mark a rune to all tanner shops and armories in Sosaria. Recall around all the tanner shops buying up hides (at 3 gps per). Cut them with your scissors to make "cut leather" and make it easier to carry. At first vendors will only stock around 20 pieces of hides, however, an hour after being bought out, they will restock with double the amount they had. Now they will have 40 pieces each. An hour after that, and they will have 80 pieces each, and so forth up to 999. This is important, as when you start getting into a roll, you will want to buy up as much leather as possible to process it, and make as many items as possible. The main items you want to make are leather arms and leather gorgets (this is regular leather armor, not studded leather), as they seem to get the best returns per leather used. Again, after crafting all your leather into arms and gorgets, recall around to all the tanners and armories selling your wares, moving to the next one as soon as you start getting diminishing value on your products. Keep in mind that not all armories buy leather armor everyday. Some might not buy today, but might buy tomorrow. I am not sure why this happens, or if it is accurate, it is just my observation. When you get to this point, and can effectively process thousands of leather a day, your income will be enough to buy pretty much anything you might want/need. If crafting/gathering is not your thing, and you would much rather travel the world and fight for your money, then you can also do that! The easiest way to make it is by creating a warrior. Your typical warrior will be created with a weapon skill and healing. It is widely advised to macro anatomy on any NPC character before adventuring out, as it will help you inflict more damage upon your prey, and heal more damage when you are hit. You can learn more about Anatomy here. Take it easy at first, you won't be able to kill medium sized monsters with your noobied sword, but you should be fine against zombies and skeletons. As a matter of fact, I'd strongly suggest that once you have gotten a small amount of gold from fighting monsters, find a player vendor (near Yew, Vesper, Trinsic or Britain) that sells magic weapons. You will be looking for weapons with the Silver prefix on them. These types of weapons do double the damage to "undead" creatures. These include skeletons, skeleton knights, skeleton magi, zombies, ghouls, shades, liches and liche lords. Your best bet is to find a town with a graveyard near, and start farming these creatures. You DO NOT, however, want to do this in Britain, as Britain's grave yard is one of the shards most popular places for players to go fight each other. You will very likely become collateral damage. Jhelom's and Nujelm's cemeteries are ideal for new players, as they are close to town and relatively unfrequented. Another way of making money (and probably the most entertaining/and most money) is to make a bard. Bards are characters that play music, you can use this music to provoke a monster to attack another monster/person/animal. As you can imagine, this is quite a powerful skill. The skills required to do so are musicianship and provocation. Music is very fast to raise, provocation however is a little more tedious. This is my guide to making a bard. Some of the concepts might seem a bit foreign or advanced, but we'll get to them on future sections. If you already have some knowledge of UO, Razors and macros in general, you can work on your crafter/gatherer while your warrior/bard is macroing his skills up. This way, you can maximize your playing experience in less time. UO is quite unique in many ways. One of them is that other players can set up shop and offer goods to the general public. Player vendors are normally located near cities and moongates. This provides for more foot traffic, and better sales. Player vendors will stock pretty much everything imaginable under the sun. Full spellbooks, single spell scrolls, runes/runebooks, weapons and armor (both crafted and magic), potions, and pretty much anything else you might need. The main "markets" where player ran vendors are established are the area around and between Yew's bank and Yew's moongate; the area around Vesper; the area around Lord Blackthorne's castle just north of Britain, and around Britain's Moongate; the area around Trinsic's moongate and it's west entrance; and the area around Moonglow's bank. There are of course vendors set up pretty much everywhere in the land, but these are the main places that concentrate them. Unfortunately there are some players who enjoy (or profit) from scamming the casual player by offering up goods that are not what they were described to be. The main example of this are full spellbooks. There are many shops that sell empty spellbooks, but the description will say "Full Spellbook". If you click on the book itself it will only say "spellbook". There is however a way to counter this scam tactic: the item identification skill. When you use Item ID on an item on a vendor, you will get a descrption of the actual item up for sale. In the case of spellbooks it will tell you how many spells are actually in the spellbook. A full spellbook should have 64 spells. You should also ID weapons and armor you buy from player vendors to reduce the probability of being scammed. Another typical scam is offering "Full Runebooks" which in reality are not full. Unfortunately not even the item id skill can help you here. You can either trust, and risk the money you pay for the runebook, or mark one yourself. Public rune libraries abound, and are easily accessible from most banks/moongates. More on them further down. Macroing is generally speaking using Razor to perform an action in a repeated manner without having to type/click it yourself. To make a macro, simply go to your razor window, then go to the "Macros" tab, and click on new. You will be asked to name your macro. 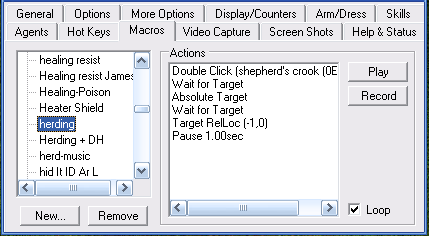 When ready, click record and do the action in game that you wish razor to do for you. Click stop. Whenever you click play for this macro, Razor will do exactly what you did in game while recording the macro. There is a box on the bottom right hand corner of this window, which when checked, will allow you to perform the same actions you recorded in a repeating manner, so as to help you do it constantly, as opposed to having to click repeatedly. This is particularly useful for raising stats and skills as we will see further down. In UOSA, we are allowed to macro skill gaining, and pretty much anything while away from our keyboards, or not attending our computers (afk). We are not, however, allowed to "afk" resource gather. What consists resource gathering? It includes, but is not limited to: mining, lumberjacking, shearing sheep, picking cotton and fishing. Things that can provide you with resources/items you can sell while afk. If you don't know if what you are doing is afk resource gathering, then it probably is, and the safe bet is to not do it. You can be jailed, your items confiscated, and you can even be banned for this offense. Common sense is the best course of action here. Of course this does not mean you cannot use macros to simplify your life!! You can make a mining macro, just be sure to be watching your screen at all times, as if a GM pops up and starts talking to you, and you do not respond in time or form, you will be jailed, and your items will be confiscated. Many people want to know the exact extent of what afk means. They ask things as: Can I watch a movie while mining? Can I get up to go to the bathroom/get something to drink? The rule of thumb is: if you are not watching your character, stop your macro. If you need to stand up to go take a leak, stop your macro. Again, it comes down to common sense. Stats are your charcters strength, dexterity and intelligence. Stats affect several aspects of your character, most notably it's maximum health (hit points), your mana pool (used to cast spells), and your stamina (used to determine the speed at which you can swing your weapon). As you can see, some are more important than other for different types of characters. In my opinion, however, strength (STR) should be 100 for all characters. I will get further into stat allocation in the "About Templates" section of this guide. Here on UOSA we have a cap of 225 stat points, and 100 per stat. Which means no individual stat can go over 100, and the sum of all 3 stats should not be above 225. You can go over 225 temporarily by using potions or magic, but the effect only lasts 2 minutes or so. So how to raise your stats? There are certain skills which have a close relationship with stats, which means that the higher a certain stat, the higher the skill (hence you might have noticed that your "shown" skill is more than your "real" skill). This relationship also means that by practicing a certian skill repeatedly, you are also working that stat, and is subject to increase. Herding is the king of skills in terms of stat gain. It should be the first thing you do after you create your character. Take the 100gps you started out with, and invest 30 or so in a shephard's crook. To work herding you need to equip your shephard's crook, double click on it, target the untame animal you want to herd, and then click on the ground where you want the animal to move to. Herding is also one of those skills which does not have a delay between uses, which is one of the reasons it is ideal to raise stats. If you leave this macro running overnight, you should end up very close to 100 STR, and should have made good progress on your other stats. If your stats are still not at the point you want them, there are other skils you can work that can help you reach your goal. Camping is another great skill for stat build up. To use camping simply gather some kindling, and double click on it. To get kindling you can either use a bladed item on a tree (your noobied dagger works great), or even better, go buy a hatchet or an axe (any type of axe, except war axe, will do). Equip the axe and double click on it and target a tree. You are now lumberjacking. If you are successful, you will harvest logs from the tree, and they will be placed in your backpack. You can use your dagger on the logs to create kindling, and get a better kindling yield per tree, plus you might get some STR gains from working lumberjacking, effectively killing 2 birds with the same stone. Camping also doesn't have a skill delay usage, so you can spam double clicking on your kindling every second and you'll be using the skill. If you are done with STR and need to raise DEX or INT, you'll probably be better off using other skills. If you need DEX, snooping is your best choice. Snooping doesn't have a skill delay, so you'll be able to work it faster. Snooping however has a karma loss, where you might end up being labeled unsavory, or another less than agreeable title. If you are worried about karma loss, you can work musicianship instead, and should still get good DEX gains. Here on UOSA we have a cap of 700 skill points, and 100 per skill (this is real skill points, not shown). Which means no individual skill can go over 100, and the sum of all skills should not be above 700. I get asked all the time about what are the best templates for something or other. I always ask what that person wants to do in game, because THAT is what will determine what skill set is best suited for each character. Templates are always personal choices, and in this type of game, you are free to be as creative as you want! I will try to go over the most common character templates (cookie cutter) and some variations they may have. Of course, none of these templates are definitive or "better" than others. My personal opinion on the Warrior is that it is a VERY versitile character, and one that is relatively cheap/fast to macro up to a useable level, and everyone should have one in at least some form or other. Choosing your weapon skill is probably the most important part of the process, as it might help determine your complementary skills. As I said before, for new players, I always recomend swordsmanship, mostly because broadswords and cutlasses are very good, abundant and cheap weapons. You can find power broadswords with tactics bonuses for as little as 500gps, and should not cost more than 2k gps. For more advanced players Fencing and Maces are good, either for different reasons. Fencing weapons are generally speaking a bit faster and can help when fighting a magery based foe. Fencing weapons can also be poisoned, adding an additional inconvinience to your adversary in a fight. On the other hand, maces have what is probably the best all around weapon for damage over time which is the Quarter Staff. It is fast, and it hits hard. Maces have the advantage of draining an opponent's stamina at an accelerated rate, and doing additional damage to their armor. Unfortunately the Q-Staff is a two handed weapon, which means that you cannot equip something else (like a shield), nor can you drink potions while wielding that weapon. As you will learn, potions are the bread and butter of Warriors. As far as complementary skills go, it is quite relative. Everyone has their favorite. I personally like to match parry with swordsmanship, tracking/hiding with fencing and some other skills with maces. I also like each character to have at least some magery for practical purposes, ie. moving around, trapping pouches and casting magic reflect, protection and reactive armor on yourself and others. Some people swear by the "Med Warrior", a basic warrior template complemented with magery and meditation. I don't endorse it, but as I said, whatever works best for you. This is the bread and butter of most PK's/PvPers during this era. It has very little wiggle room to excell, and it is highly sought after due to it's ability to inflict a large amount of damage in a short time. A variation of the Tank in the "Glass Tank" where Anatomy takes the place of either wrestling or resist. Some variations o this build are adding Hiding instead of Wrestling or Resist (or even Eval Int). If you feel inclined to add hiding to this template (not saying that you should) I strongly advise against dropping either Wrestling or Meditation, as I consider them much more useful than Resist or Eval Int on this char. Cartography and Lockpicking are the only 2 firm skills on this one. Some people have Stealth instead of Meditation, some people have Wrestling or Evaluating Intelligence instead of Hiding. And some people basically only use this char to dig up and pop open the chest. They will bring a bard along to do all the hard work. Alternatevely, if you have not GMed Lockpicking, but still want to do lvl 5 treasure maps, you need to add at least 60 Detect Hidden to your template to be able to open the chests. Personally, I do chests with just one guy. I used Stealth / Hiding on him while I GMed Lockpicking as it was real easy to throw a gate from town, hide, go through the gate, stealth is necessary, lockpick the chest, stealth a step away from the chest, open, loot, recall to the bank. (Notice I did not include telekinesis or dissarming the chest, as dungeon chests will not harm you as long as there is at least one empty tile between you and the chest.) When I GMed Lockpicking, I dropped stealth for meditation, and can solo lvl 5 maps without too much hassle. Rune libraries are player run establishments that hold a series of runebooks with varying locations worldwide. These will generally be hosted in public buildings, and are open for anyone to use. This will help you move around, and get to any possible destination you might need. If your skill is not high enough to use the recall spell directly, you can always use a scroll by dropping it in the book that has the destination you wish to travel to, and then clicking on the blue button next to the rune name. To use the recall or gate spells, go to the page in the book that has that destination marked, and click the corresponding spell icon on that page. Roadkill's library hosted in Justice Island. $$$'s Rune Libraries, one hosted in the southwestern most tip of Verity Island (where the city of Moonglow is located) and the other just north from Trinsic's West entrance. C^V's Vesper Inn Library located just south of Vesper's southernmost inn. C^V's Grand Library of the Vigilant located in a building south off Vesper bank's west bridge (close to Vesper's Cemetery). Smithy's Castle located in a castle just east of Yew Moongate. DG's Rune Library located North of Chaos shrine in DG town. Thieves are always a tricky proposition. You never know exactly what you might get with one. Best way to prevent is to put your stuff in a red box (or any other lockable container), but actually, magic lock it, that makes it impossible for them to get through (just make sure it weights more than 11 stones). Also, if you are thinking of enganging a bank thief, just realize you are unsure if he has fighting skills, and you can be quite sure he'll steal your bandages, regs, runes, potions, and weps if you unequip them to drink a pot. Work in progress, just a link that might help:. One of the more exciting ways of creating wealth in this game is by treasure hunting. On rare ocassions monsters will have a treasure map as part of their loot. Fishermen have also been known to get lucky and fish a treasure map out of the deapths of the sea. However all maps are not created equal. Higher level monsters will hold maps for treasure chests that are much more valuable than chests from maps that have been fished up or have been dropped by lesser monsters. But be very wary, every treasure chest will have a fair deal of creatures who will guard the treasure with their lives. As is the case with who drops the map, the higher level maps will have much more formidable guardians than lesser maps. Once you have acquired a map, your first order of business is decoding it. For this you will need the cartography skill. Characters with 0 cartography skill can decode level 1 treasure maps, they might fail a couple of times, but eventually will get it. If they try to decode higher level maps without sufficient skill they will get a message that says something to the effect of "this map is too difficult for you to decode". This come in real handy when you have amassed a good number of maps, and don't know where you got them from. There are people who have characters at different cartography levels who can assess with precision the level of each map. But I digress. Once you have successfully decoded a map you need to find a way to get to its location. There are 200 confirmed locations for treasure maps, and they are all numbered out in a very handy guide. This guide can be found following this link. "Also, I have found THB_Offline.v1.01.exe located here to be helpful." (Thanks applejack) Most rune libraries mentioned in the corresponding section above includes a section for treasure map locations following the numbering on that guide. If you would like to enhance your adventure, you could get a boat or just run to its location. A sextant is a very handy tool to carry along, as it will provide you the exact coordinates of where you're standing, which can be compared to those on the stratics guide. Some other helpful gear to carry on your treasure hunt is a shovel, lockpicks, an axe (any type) or hatchet, and a container to bring back all your loot in (a pouch, bag, backpack work just fine). So you have found the exact location of a map, now what to do? First you must dismount so you can dig up your trasure. You dig up the chest by double clicking your shovel then targetting the map, and THEN targetting the ground. A common mistakes by unexperienced treasure hunters is failing to target the map after double clicking their shovels. The higher your mining skill, the wider your "dig" radius is. However mining is quite useless if you're using the stratics guide and a properly marked treasure rune library or sextant. As soon as the chest is fully dug out, a small army of monsters will appear. These will need to be taken care of. Keep in mind that treasure chests are locked AND trapped. Lower level chests can be unlocked by using the magic unlock spell with the sufficient magery skill. Higher level chests will require a character with lockpicking to pick the chest. Level 5 chests can only be unlocked by characters with GM lockpicking or 95 lockpicking AND 60 detect hidden skill. The chests' trap have been known to kill explorers, so that is why it is highly recommended to use the telekinesis spell on the chest once it is unlocked and before opening it. After disarming the trap, the loot inside the chest is freely lootable to anyone around. Keep in mind that as you remove items from the chest or move them around, there is a good chance of spawning more guardians by the chest. When you're done looting the chest, please take the courtesy of using an axe on it to destroy it, as this will allow other treasure hunters who come behind you to dig chests up at that same location. If you fail to do so, your chest will block the location for up to 4 hours. It is important to note, that only the character who dug up the chest can destroy it. Everyone has their own way of doing t-maps, so do not take this as gospel, I'll just share my way of doing them. Template: template for t-hunters are detailed above. My suggested build is: cartography, lockpicking, musicianship, provocation, magery, meditation and hiding. Stats: 100 STR, 100 INT, 25 DEX. When you start digging, the chest will have 7 "steps" between showing itself breaking ground and being fully dug out. The first of these is very hardly noticeable. This is important, because if you can time this well, you can hide as soon as the chest pops up, and buy a bit of time before the monsters aggro on you. This is particularly helpful in higher level maps where the initial spawn include balrons and poison elementals which can spell immediate death for the digger. Since you need to dismount, and monsters will spawn immediately with the chest, it is sometimes helpful to order your mount to stay, and casting invisibility on it. This might spare its life while you can bring it out of hiding and remounting safely. Once you have unlocked the chest and popped the trap, drop your loot bag into the chest. Instead of dragging all the loot from the chest into your backpack, drop it in the loot bag you placed in the chest. This will make it faster to loot, as your cursor needs to "travel" less between the loot and the bag in the same container, vs. the loot to your backpack. It also helps you not get encumbered (overweight) in case you need to make a hasty retreat from the chest if a large monster spawns. And if you do eventually get over weight, it makes it easier to gate-hop the loot out. Chests have a good amount of guardians left after you're done looting the chest. If you want to "milk" the chest for maximum profit, you can put an item in, and just move that around. What I do is record a brief macro that moves the loot bag twice inside the chest. Put a 1 second pause between each move, and check the loop box. Now press play, and the bag will start moving in the chest forcing spawn to come up. You can keep the macro going and it will not interfere with other functions like provoking creatures or targetting spells. You just stand by the chest, and you'll be moving that bag around. If you're moving the bag constantly for a couple of minutes and no monsters are spawning, you have probably milked it dry and are ready to leave. All other programs are strictly prohibited. http://wiki.uosecondage.com/Beginners_Guide - Beginners Guide in the wiki. UO is a cutthroat game. You will die...a lot. You will be stolen from. You will loose stuff you have worked hard to acquire. And there are people out there whose only goal is to make your UO life misserable. Why endure all this? Simply because there is no other game that quite replicates the world UO created. The freedom you have. The choices you must make, and the consequences associated to those choices. The best piece of advice I can give you is to play UO like it was meant to be played. Like a multi-player game where you interact with others. Make friends and make enemies. Join a guild, it's the best way to stay safe, and protect your belongings. There are very few players that I know that played UO as a single player game and stuck around for more than a couple of weeks. Join IRC, there is a whole lot of information in the heads of other players...tap into that!! Last edited by Derrick on Sun Dec 22, 2013 9:34 pm, edited 10 times in total. http://forums.uosecondage.com/viewtopic.php?f=42&t=28469 - My new player experience, things I want to share. Good Job Pirul for this guide! TL ; DR... haha J/K, great work Pirul! Thanks for taking the time to prepare and write this Guide! [20:08] <@Kaivan> We have a ridable Maahes in Green Acres. What a guide, nice job man. Hello, i was wondering if it is possible to purchase gold via paypal? [22:31:51] <wintergate> Has anyone really been far even as decided to use even go want to do look more like? Just want to make sure my account is always available when I want to play. Thank you for any assistance! If you've already attached an email address to your account(s), then I am sure you are fine. If you feel you might need to do more to 'sew it up', then the only thing I can recommend is to create an account at MyUOSA, and link your playing account(s) there also. Establishing yourself at MyUOSA might offer you an additional layer of game-account security. That's the only thing that comes to my mind. Assuming you're new, welcome. 1 Human Brain, never been used, only slightly damaged, still in original packaging. The inability for this person to respond in such a crazy manner proves my point.